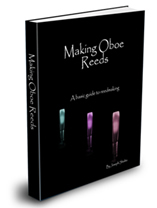 We always hear that you should have a responsive oboe reed. So what does that mean? Well, basically it means that all of the notes come out when you want them to come out. Can you have a good responding reed with a lot of resistance? Yes. The thing is, resistance is a very personal thing. What is considered the perfect amount of resistance for me, may be too hard or too soft for you. Play a middle “G” very softly without using the tongue for the attack. Remember to play “piano” and just let the note come out. If the reed responds well, it should come out smooth and beautiful. If it honks out and you hear very strange sounds, there is a problem with the basic response of the reed. This test not only shows me what is happening to the response, it is giving me information about how the tip of the reed is balanced. The vibrations start at the very tip, so if this is not the thinnest part of the reed, you are in trouble. The second aspect of response is what I like to call (and I can’t take credit for calling it this) “the fast response”. I want enough resistance to blow against, but if it gets too much, the notes won’t come out nicely. I like to check this with a variety of soft and loud dynamics using different notes in different registers. I want the notes to come out without any effort and without any cracking of the sound. Kind of the “bull in a china shop” feel. sometimes it feels like you are swimming in a pool with somebody’s finger pushing up against your forehead. To fix this, make sure the opening of the reed is not too big. Then adjust the transition from the heart to the tip. Ok, now that we have that fixed, it is time for the real response test. Play some low “C’s” and “C#’s” with fast sixteenth notes. They should all come out very clearly. If they don’t, first make sure you are not biting the reed. If everything is ok with your lips and air, look at the reed and see what the crow says. Check the end and corners of the tip of the reed to make sure that they are the thinnest parts. After that, check the integration from the heart to the tip. Don’t forget also that a small bit taken out of the back of the reed can do wonders. If the crow drops, make sure to clip it back. Everything is give and take, or “balance”. I hope these suggestions work. It is very important that every note sounds when you want them to sound, not when the reed wants them to.